Today's Plus-Size Runner is More Confident: Find Out Why! Today’s Plus-Size Runner is More Confident: Find Out Why! No society is immune to prejudice, and obesity remains one of the most insidious. But with the right attitude and today's plus size fashion designs, every plus size athlete can feel as great as she looks! Pop singer Meghan Trainor couldn’t have known that her smash hit song “All About that Bass” would become an anthem for plus-size men and women living in every corner of the world. It’s been two years since that song was first released, but the accompanying video remains a favourite because it’s filled with dancers and back-up singers who haven’t fit into a size two since they were two! Why has Meghan’s song struck a chord? Because rising obesity rates have shifted the way we look at weight-related issues and this bastion of prejudice is finally beginning to disappear. 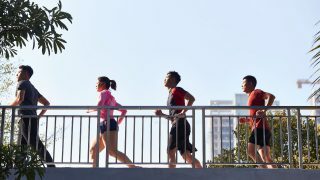 Despite impressive efforts to promote healthy living and exercise throughout Singapore, our nation has not escaped this trend. Obesity continues to impact all strata of society from clothing sizes to weight-triggering illnesses like diabetes, heart and cardiovascular disease. Singapore has shown an especially alarming rate of weight gain in children. It's risen from 8.6-percent in 1992 to 12.9-percent in 2010. But, it’s not just children who are affected. Adults are, too. And we believe that one of the best ways to fight obesity is to alter one’s habits; eat healthy and exercise. 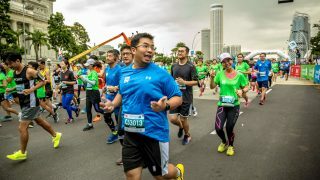 Of course, plus-size men and women face their own discrimination thanks to societal bias against those who aren’t slim and trim, so just being brave enough to put on running clothing isn’t always easy. That’s why an expanding universe of plus size athletic gear has taken the world by storm. These wardrobe items are fashionable, trendy and they beautifully fit the plus size body. In fact, plus size active wear is helping turn the perception tide. After all, no matter one's size, if you look good, you feel good and the desire to make healthy lifestyle changes grows even stronger. Why does society judge heavy people? It’s no secret that overweight people are subject to scrutiny and judgements thin people rarely experience. It’s so bad, even when obese people try hard to change their bodies by exercising, ridicule continues to be dispensed by disapproving people. The stigma is so pervasive, negative character flaws are regularly attributed to overweight people when they are referred to as lazy, sloppy and slovenly, even by observers who don’t know them. This prejudice against obesity is so prevalent, research shows that when overweight people are defendants in legal cases, the likelihood that they will be convicted is appreciably higher than guilty rates of slim defendants. Further, overweight people suffer myriad psychological ramifications. Obese men and women live with feelings of shame, low self-esteem, lack of confidence and, in some cases, they even hate and blame themselves because they can’t get their weight under control. The media makes things worse. From negative images of fat people who are powerless to stop eating to waif-like models held up as examples of perfection, people with weight issues come to be defined by their bodies rather than their characters. Plus-size runners: Dress to thrill! Despite all of this negativity, the tide is beginning to turn. More heavy people are stepping out of the shadows, learning to eat sensibly and exercise. To meet the needs of this emerging demographic, savvy companies are making products just for people eager to get fit and enjoy an active lifestyle by producing fashion forward garments that look as great as they feel. Have you introduced your body to what “Runner’s World” magazine calls the “bedrock of the plus-size fitness apparel industry”? The brand is JunoActive and it’s been around for 20 years, so even if you’ve been disappointed by size restrictions, JunoActive—whose founder started the company because she was plus size and grew weary of boring garments and a lack of availability - fashion statements will have you doing a happy dance. These trendy, fashion-forward separates run the gamut from size XL to 6X and every piece is oh-so-stylish and comfy. Head for the REI website to peruse extended-size clothing and even socks! We love the name, but you’ll love the roomy feel when you get your hands on Team Estrogen socks in sizes up to 5X. Athleta apparel is also sold by REI and you’ll find all of the features and benefits you find in regular sizes: flat seams, chafe reduction design and sweat-wicking textiles. With each new season, Athleta debuts exercise wear in the hottest colours and cuts, so your wardrobe couldn't look boring if you tried. Your kingdom for a great sports bra in a size that actually fits! We see you shaking your head as you think back to all of the “sports bras” that served as sausage casings while you stuffed your assets into them in the hopes you would survive your exercise class without passing out from the pain. Nike Pro Hero and Moving Comfort sports bras are designed with support in mind and you can buy them in sizes up to 38E. Expert engineering is the secret behind the sports bras produced by both companies so discover what it's like to run a jiggle-free race! Lane Bryant has been kicking around for decades and the reason they’ve stayed in business so long is by catering to plus size women even before the rest of the world came around. Their store brand, Livi Active, is filled with athletic apparel that’s both fashionable and roomy (up to 4X). Not to be outdone by this vintage brand, Old Navy has also answered the call for more plus size active wear with their own Old Navy Active performance gear collection. Watch the crotch. That’s not a bit of humour; it’s a recommendation that could save you from being miserable from the moment you slide on those Spandex pants only to find that they only slide up to your hips. Forget drawstrings. If you spot them on the shorts or pants you like, run in the other direction. You need a wide elastic waistband. End of story. Enhance your silhouette by choosing separates with flat seams so you don’t add any additional bulges. Flat seams can even make you feel slimmer since puckers and bumps are all eliminated. Think thighs. When asked about the most annoying rub of all, the majority of plus-size women agree that inner thigh chafing is a nightmare and can make even a short race feel as though it’s never going to end. Combat this possibility by purchasing bottoms that don't expose your skin to thigh-on-thigh rubbing. 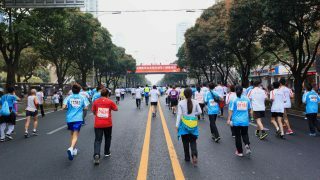 Do you have an inspiring weight loss story that is related to discovering your passion for running? We would love to read it!